I simply had to take the train to Brighton to see this. I’m familiar with projects that get completed years later than envisaged – a decade seems to be common, 20 years not unknown – but this one tops the lot. The original design for the entrance gateway tower of Brighton College was by architect Sir Thomas Graham Jackson, a pupil of Sir George Gilbert Scott, 127 years ago – five years before the RIBA Journal was originally launched – but left incomplete. Until now. It has finally been finished, by Richard Griffiths Architects. You can’t argue a pressing financial or functional case for this £3m project. 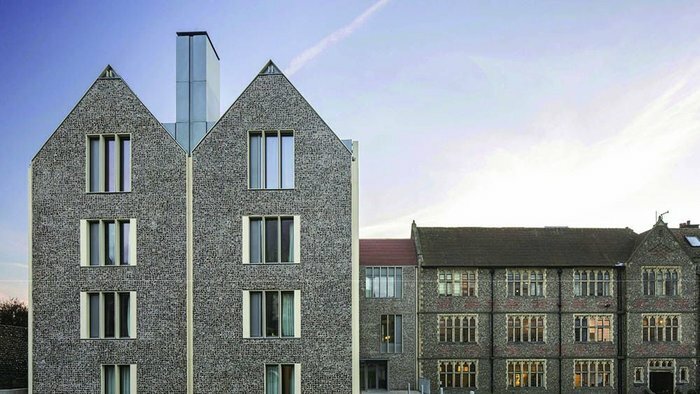 At the end of the day the college – a spacious self-contained campus set on a busy commercial road towards the eastern end of town, its original 1849 buildings by Scott himself – gets a couple of interesting large new square rooms above the headmaster’s existing study. This is where the tower came to an abrupt halt in 1887 at only two storeys, with a pitched roof carelessly flung across it between the flanking wings of boarding houses. All is now grade II listed, as the completed tower will automatically be. One of the new spaces is a meetings and function ‘fine room’ (one can imagine potential donors being wined and dined here), the other, on top, is shared by deputy head Alan Bird and Lord Skidelsky, noted economic historian, old Brightonian and chair of the board of governors. Skidelsky was at his desk when I popped in. He was dwarfed by the scale of the space. Far above his head was the underside of the lead-and-bronze clad cupola acting as a lantern for this top room, which was fabricated off-site and craned in. From outside it’s a pleasingly fanciful thing, this cupola, which also acts as an elaborate support for a weathervane on top, consisting of a pelican (emblem of the school). Steelwork structure for the cupola is distinctly non-trad. Since Brighton College is one of the top independent schools in the country, with some very wealthy alumni, just one donation – provenance anonymous – was enough to see the job through. Its value comes in its image: finally there is an entrance appropriate for a school of this high status, though the south elevation of the tower, seen from the road outside, is in redbrick and terracotta dressings, slightly plainer than the flint and more numerous moulded terracotta dressings of the north facade to the inner courtyard. It’s when you pass through the vaulted entrance arch to this inner quad, turn round and look back, that you get the full impact. From that viewpoint the Cairns Tower (named for the current head Richard Cairns who occupies it), with its large new clock, has quite some presence. Smith of Derby also designed the sundial which occupies the south face of the tower. The moulded terracotta details of the existing building’s north elevation are very well matched in the new work. It’s noticeable, if you have Jackson’s perspective drawing to hand, that RGA has changed his finickier design details: this is by no means a slavish imitation of Jackson’s knock-off of the Anne Boleyn Gatehouse at Hampton Court, and the closer you look the more variation you find – while of course present-day building regulations had to be observed. This was how it was originally meant to look, as drawn by Jackson. Two sets of original chimneys had to go to make way for the upwards extension (Jackson gave no clue as to how he would have handled the chimneys), and the extended stair tower is marked by a new high-level asymmetrical gable. But still, it is a remarkable interpretation of the original design, even though the decision was made to put in plain double-glazed window units (with hand-made glass for better surface texture) rather than the diamond-leaded single-glazed versions of the lower tower. With solid stone mullions and transoms making traditional cold bridges, some insulation gains had to be made somewhere, and fake diamond leading of the kind beloved of plastic window manufacturers was rightly rejected. There is a mix of solid-wall construction and insulated twin-leaf wall overall. What kind of architecture is this, I wonder? It’s hard to categorise: not pastiche, not restoration or conservation, not wholly original design, though there is much more creativity here than you might think, and everything obviously had to be drawn from scratch. But it does carry out the broad intentions of a long-dead architect (Jackson died in 1924 aged 89). And while it is an exercise in traditional materials and careful craftsmanship, modern-day offsite construction is used as well. That cupola was made as a sizeable steel structure and craned in as one piece. Its relatively simplified appearance, says Griffiths, reflects its mode of construction. Walking round the building, it becomes apparent how tricky this job was. How best to extend a solid stone spiral stair upwards? (Answer: by making it an open thin-waisted cantilevered construction, so reducing the impact on the new spaces). There is an awkward level change at one point as it deals with an existing floor level alongside. New solid oak doors occupy gothic openings. But you also find modern light fittings designed by Tom Dixon which work well in this space, along with contemporary art – and the underside of the cupola in the top room is treated in modern fashion. There was one moment, though, when I was being shown the headmaster’s study when the head himself popped in. ‘What are you doing here?’ he asked, amicably enough. 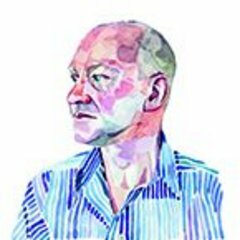 Hard to avoid looking a bit shifty in those circumstances, even though I am way older than Richard Cairns. Headmasters have that effect on you and this is his tower, after all. New door, old style. Gothic oak joinery forms entrance to the new tower rooms. Brighton College is by no means ultra-traditionalist in its commissioning. 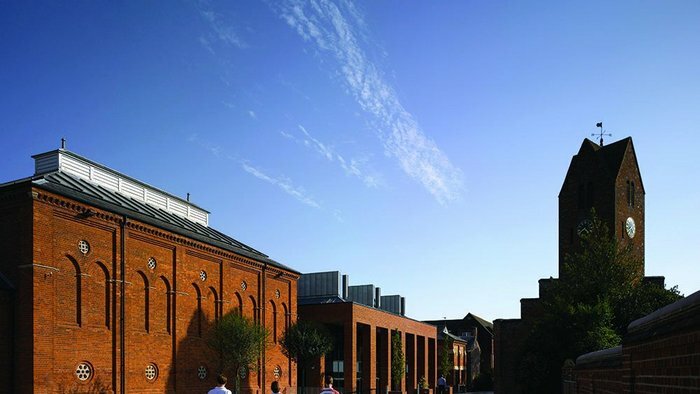 The original buildings may be by ‘Great’ Scott himself and continued in similar vein by Jackson, but in recent years, in a programme overseen by project director Steve Patten, it has acquired some fine new buildings by Kirkland Fraser Moor, Allies and Morrison and Tim Ronalds. Hopkins will add a sizeable new academic building in 2016. All respond in various ways to the existing materials, scale and context of the campus, with only Kirkland Fraser Moor’s Skidelsky building bucking the trend in black brick (and even that could be said to pick up on the flint). It all works as an ensemble: wandering through the courtyard you get a sense that the architects as well as the school are acting in collegiate fashion.